Sometimes we need to move across the ocean for that huge, transformative experience. Imagine a teacher of English winning the Fulbright scholarship and getting to come to the country where English is spoken not only by its citizens but also by thousands of other international students pursuing their dreams! It’s a great feeling of happiness, joy, delight and so much more when you are given a platform to live your dream! 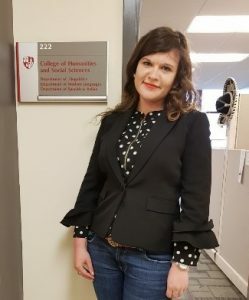 That was just the way I was feeling about the opportunity to do research at the Linguistics Department of Montclair State University, New Jersey. I have been lucky to investigate the binding power of English as an international language first-hand. My research involved collecting texts and interviews from non-native speakers of English to discover how their personality impacts the way they use this language and how their identities are transformed in the process. Thanks to the Fulbright Program and a number of networking events, I could take advantage of connecting with people from around the world and hearing their stories. Over these ten months I have found myself experiencing different locations on the world map, including some places I didn’t know existed. I not only expanded my network through extensive geography and culture classes, but more importantly, I met with American and international students who do things that make life worth living. We would get together to talk, to laugh, to share – our lives, our stories, our worries. I also learned about the bonds created through food as I went out for meals with fellow Fulbrighters. Another beautiful thing that is even better when done in a group is traveling. 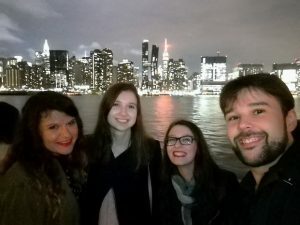 With my new friends I would have never met if it wasn’t for the Fulbright, I got to explore the crazy world of New York City – a perfect playground for a linguist that made me want to try to learn even more languages to understand more of the enchanting polyphony of its streets. It was equally wonderful to go beyond NYC and get a taste of the unique beauty and character of other parts of the United States. Never at any point during my academic, social and personal journey have I felt like a foreigner because of the Americans, and the entire international crowd, who supported me during my Fulbright and gave me something to miss when I return home. I am still working on answering my research questions, but I can conclude that the effect a Fulbright experience has on our personality and identity is beyond words. I know we will all return to our homes different people – more humble and educated about this world and feeling so much smaller and more connected thanks to all the beautiful people each of us has had the honor of meeting along the way. Read more about Olga’s Fulbright research project, and her Fulbright experience.